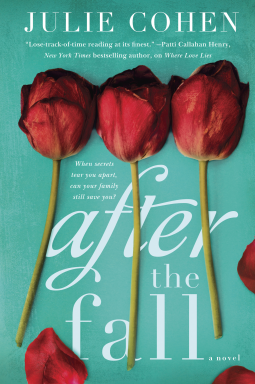 What They Say....From the author who brought you Dear Thing, Julie Cohen, comes After the Fall--a poignant, beautifully heartbreaking novel about what it means to be family, the ties that bind us, and the secrets that threaten to tear us apart. What I Say..... I loved Dear Thing by Julie Cohen, so I was excited to get an ARC of her newest book. And I was definitely not disappointed. Jo's recently divorced - her husband took up with their nanny. Even though this is a pretty awful thing to do, Jo keeps bowing and scraping to him and acting like he's not a total pig. When her first husband's mother, Honor, takes a nasty fall, it's impossible for her to return home. She is not close to Jo (or anyone for that matter), and actually isn't even very nice to Jo, but true to her subservient nature, Jo brings her home to recuperate at her house. The timing couldn't be worse, as Jo's daughter, Lydia is struggling with her realization that she is gay, and in love with her best friend. Jo has a secret affair with one of Lydia's teachers, who is also their neighbor. And they are all skirting around the issue of Jo's first husband, Lydia's father and Honor's son, and their relationships with him an his untimely death. They are all circling each other, each trying to hide their own secrets. But as they begin learning to talk to each other, they find that the family they are making is more than enough. I love the characters that Julie Cohen creates, they are flawed, human and you end of caring about every one of them.....except for the nanny and the ex!